Bob Cury at RJC Yachts reports a $600,000 price cut on the 33.8m cockpit motor yacht Cherish. Built by Broward in 1997, Cherish is a four-stateroom motor yacht with aft crew quarters. Her custom interior was designed by Patrick Knowles and features honey-oak joinery with a casual neutral toned motif throughout. Her main deck features a comfortable saloon with formal dining complete with a large flat panel HDTV, Bose stereo system, and wet bar for entertainment. Forward is a large gourmet galley with Sub-Zero refrigeration and a large settee for causal dining. Outdoor areas include a spacious aft deck, oversized cockpit and enormous flybridge with seating, sunpads and wet bar ialong with a grill and Novurania tender. Powered by reliable Caterpillar 3412 engines, Cherish cruises comfortably at 18 knots with a 20-knot top end speed. Large yacht options include digital Naiad stabilizers, Northern Lights 40KW generators, bow thruster and more. Additionally, Cherish received a exterior paint job in white Awlgrip by Roscioli Shipyard in 2011, and has since, says Cury, been maintained to the highest quality yacht standards. 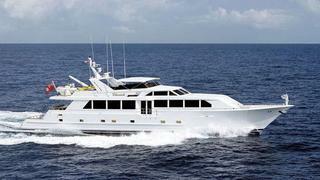 Cherish is now asking $2,195,000 and will be arriving at the Pier 66 Marina in Fort Lauderdale this weekend.